Map, Hampshire, scale about 3 miles to 1 inch, by John Cary, London, 1789; published 1789-1806. Published in 'Britannia: or, a Chorographical Description of the flourishing kingdoms of England, Scotland, and Ireland, and the islands adjacent; from the earliest antiquity. By William Camden. Translated from the edition published by the author in MDCVII. Enlarged by the latest discoveries, by Richard Gough, ... illustrated with Maps ... London: Printed by John Nichols, for T. Payne and Son, Castle Street, St. Martin's and G. G. J. and J. Robinson, Pater-Noster-Row, MDCCLXXXIX.' 1789. The atlas is in three volumes with many illustrations as well as the maps; there is a map of Judges's circuits in Great Britain and Ireland, a map of England and Wales, a triangular distance table, etc; the atlas size is 10 x 17 ins. The atlas has title page, contents list, county maps and general country maps; its size is 13 1/4 x 20 ins. The 1805 edition has the Andover Canal which is not on the 1789 edition. the second edition is in four volumes; there are additional maps of 'Britannia Romana' and 'Saxon England'. 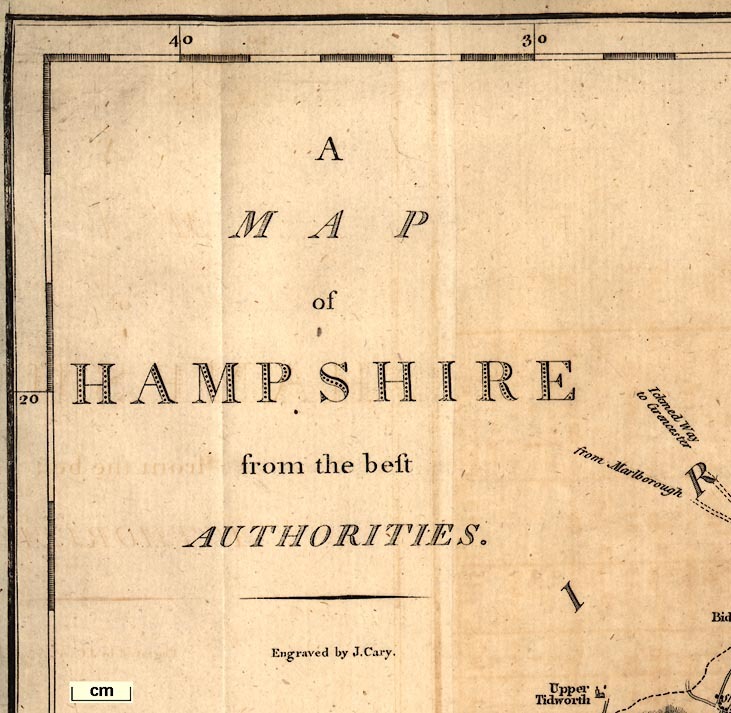 inscription:- -- upper left A / MAP / of / HAMPSHIRE / Engraved by J. Cary.